Portland, Oregon duo Henry Kammerer (vocals and guitar) and John Johnson (percussive stuff and vocals) blend traditional blues with a whiskey-drinking garage bent. With plastic buckets attached to their ramshackle drum kit, and Kammerer's ability to pick, strum, or slide with ease, Hillstomp's One Word is as down home as they come. Casual and soulful, Hillstomp would sound straight out of the 20s if it weren't for the recordings sounding modern. Despite that (or because of it), the band thrives on record as much as they do in a live atmosphere. With eleven songs filling out this forty-five minute album, Hillstomp travels through their old-time blues influences, adding a country element here and there, and delivering a record that puts other duos to shame. Hillstomp doesn't try to compete with the blues-rock duos out there, the ones that always seem like they're lacking due to no bass player. 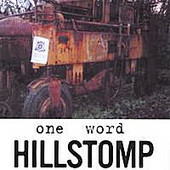 Hillstomp doesn't care to rock (though at times they do without trying); their focus is to craft timeless songs and a recording that will withstand the test of time -- much like the blues records from the 20s that influenced them. Do they do it? Well, only time will tell. But, if they didn't, they came pretty darn close. I'll give this an A-.